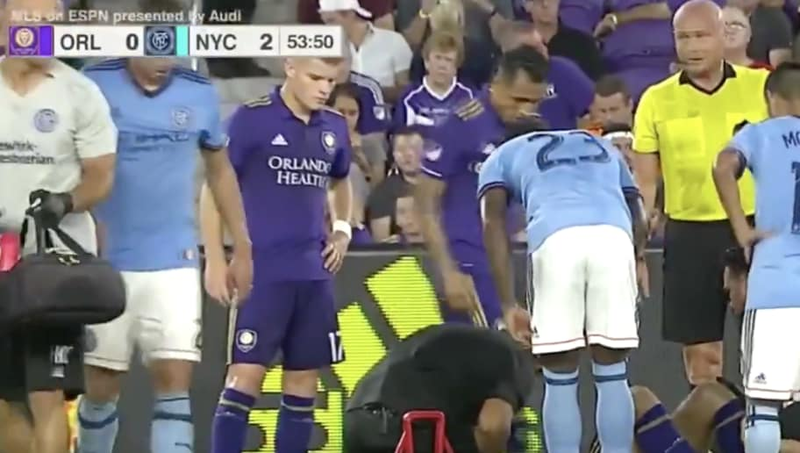 ​During Thursday night's game between Orlando City and NYCFC, there was an injury stoppage around 53 minutes into the game, which gave some Orlando City fans the perfect opportunity to yell out some pretty brutal insults that are in no way safe for work. After a player on NYCFC got injured, a fan who was likely an Orlando City supporter could be heard yelling, "You (expletive) flopped!" After about twenty seconds, the insults intensified. The same fan continued to comment as the injury delay persisted, claiming the player looked like a highlighter. He would elaborate a few seconds later, adding, "What a bold color choice? Is that floral for spring? Magenta?" Near the end of the clip, the fan finished with perhaps the worst insult of all. Looks like someone had too much to drink at the stadium on Thursday. At the end of regulation, NYCFC picked up a 2-0 win over Orlando City, their 13th of the season. NYCFC will face the Sounders in ​Seattle on Sunday before returning home to ​Yankee Stadium for a game against the Vancouver Whitecaps next Saturday.